Craig Anderson made 37 saves to help the Ottawa Senators move within two points of the first-place Montreal Canadiens in the Atlantic Division with a 2-1 win against the Florida Panthers at BB&T Center on Sunday. Zack Smith and Kyle Turris scored for the Senators (33-21-6), who are 2-1-0 on a four-game road trip. The Senators have two games in hand on the Canadiens. Jonathan Marchessault scored for the Panthers (28-23-10), who have lost three games in a row at home after a 5-0 road trip. James Reimer made 31 saves. The Panthers are three points behind the Toronto Maple Leafs for the second wild card into the Stanley Cup Playoffs in the Eastern Conference. 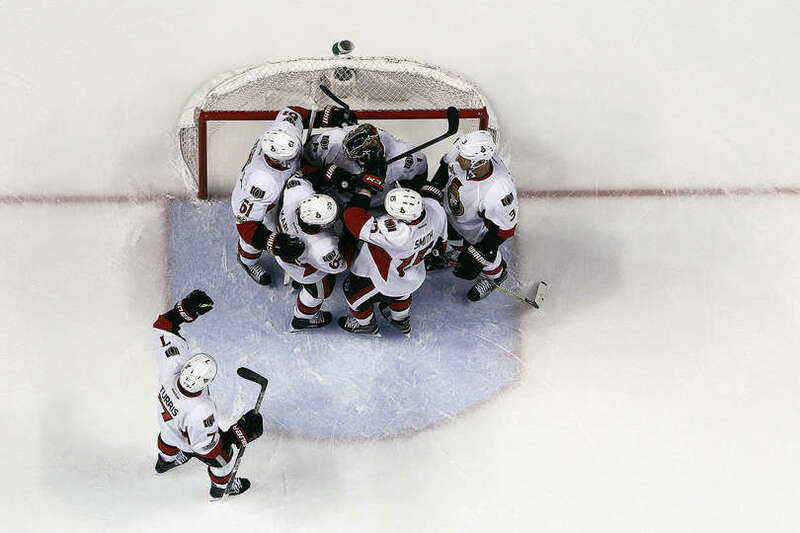 The Senators were coming off one of their poorest efforts of the season in a 3-0 loss to the Carolina Hurricanes on Friday, but they have shown the ability to bounce back this season. Turris gave the Senators a 2-1 lead at 9:58 of the second period when he scored his 21st goal of the season. The Senators took a 1-0 lead at 6:28 of the first period when Smith scored shorthanded on a rebound of a hard shot by defenseman Erik Karlsson from the right wing. The puck bounced off Reimer and into the slot to Smith, who was charging towards the net. It was Smith’s 15th goal of the season and his third shorthanded, tied for the League lead. Turris took a pass from Mike Hoffman and broke in on the right wing. He cut to the net and lifted a shot over Reimer’s left shoulder into the top of the net. At 11:09 of the second period with the Panthers on the power play, Anderson and Zack Smith teamed up to stop a backdoor attempt by Florida’s Reilly Smith. Smith got his stick on the puck and Anderson made a glove save to keep the Senators ahead 2-1. Marchessault’s goal was the result of a nice three-way passing play. Keith Yandle started it at the point, passing the puck down to Jonathan Huberdeau in the right wing circle. Huberdeau passed it across the slot to Marchessault, who put it in the open side of the net for his 19th goal of the season. Senators defenseman Dion Phaneuf played a game-high 28:02 and led the team with five blocked shots. Zack Smith leads the NHL with eight shorthanded goals since the beginning of the 2015-16 season. … Senators forward Chris Neil moved past Ken Daneyko and Joe Kocur into 20th place all-time in NHL penalty minutes with 2,522. He had seven in the game.